I’m doing something I haven’t attempted since I was at university, many years ago. I’m reading through the Bible in a year. Make that two years: after twelve months, I’m half way through my Bible reading plan. There’s something exciting about reading the Bible in big gulps. I feel well-fed, like I’ve been at the richest of banquets all year long. I’ve discovered long-forgotten treasures, and I’ve seen familiar verses shine with unexpected colours in their setting. I’ve been reminded how, verse after verse, chapter after chapter, the Bible tells the same story. I can’t wait to turn the pages and watch the history of salvation unfold. My friend Melanie likes the ESV Chronological Bible Reading Plan, where you read a few chapters in one place a day. The chronological order means you can see, for example, how the different psalms fit into Bible history. I’m looking forward to trying this one! Rachael appreciates the Thematic Bible Reading Plan. She says, “There are two or three readings a day. You read through each book from beginning to end. The books are placed together in such a way as to help you to make thematic connections between them.” This plan looks excellent – another one I’d like to try. Meredith enjoys the ESV Daily Reading Bible plan, where you read in three places a day – Old Testament, New Testament and a Psalm (she talks about her experience in my Bible reading plan, mid-year review and this interview-with-self). Justin Taylor recommends the ESV Study Bible Plan, where you read in four places a day: Psalms and Wisdom, Pentateuch and History, Chronicles and Prophets, Gospels and Epistles (you can even print out four snazzy little bookmarks to mark the places in your Bible!). John Stott faithfully used the M’Cheyne One Year Bible Reading Plan, where you also read in four places a day, chosen to give the big picture of salvation history. He said, “Nothing has helped me more to gain an overview of the Bible, and so of God’s redemptive plan”. Don Carson’s For the Love of God gives you daily readings to use with this plan. I’m using the NAV Book-at-a-Time Bible Reading Plan, with two readings a day: a short reading from the wisdom books or Isaiah, and a longer reading which swaps between testaments and spreads the gospels through the year. I like the variety and the focus on one book at a time, and it’s very forgiving, with twenty-five readings a month; similarly forgiving is the four-places-a-day NAV Discipleship Journal Bible Reading Plan. A great method to get young Christians started (it got me started) reading through the Bible is the three-year Bible reading plan from Tim LaHaye’s How to study the Bible for youself, which is designed to introduce newcomers to regular Bible reading (first year gospels and epistles, second year wisdom and epistles, third year the lot). Thanks Jean – what a bundle of good resources! I think I’m too easily distracted by multiple readings, so am trying a ‘two bookmark’ method. One bookmark starting at Genesis and reading through the whole Bible (except for Psalms). A second bookmark in Psalm 1 – and from time to time I add a Psalm to my other reading. I thought it might be hard reading all 150 Psalms in a row. I’ve really enjoyed discovering a different kind of ‘close reading’. A close reading of three verses will drill into wordplay and repetition, etc. But a close reading of three chapters sees connections and story development that I’d otherwise miss. Sounds like a good approach! Yes, I too find multiple readings a bit confusing and “bitty”, which is why I’ve chosen an approach with one longer and one short (wisdom) reading. I like the sound of the chronological plan for similar reasons, and because I like the different perspective it brings to bear on the Bible. Wouldn’t work for most people (I read pretty fast) but I once found a whole bible in three months plan helpful. It took a lot of commitment but moving that quickly gave a good overview of how it all flows together and meant I wasn’t getting bogged down in some of the tougher books. Wow, that’s amazing! I’ve never read the Bible in a big gulp like that, but why not? I’d do it for a novel! Thanks, Joanna, for sharing your experience with us. You can find the M’Cheyne Bible Reading Plan online at http://hippocampusextensions.com/mcheyneplan/ with links to the NIV at the Bible Gateway. I love his introduction. Thanks, Karen, I’ll try to remember that link next time I write about this! I’ve been using the Carson reading plan for 2 years now after Reg suggested it to our church (Gymea Anglican) before he finished up. It’s a great study, and helpful to have a short commentary per day. 4 chapters a day was a bit hard though, so I switched this year to 2 chapters a day and it’s been much more manageable. Yes, Ross, I find two readings a bit more manageable too. Ive been using podcasts to help me read through the bible for the last two years (through the ESV website). 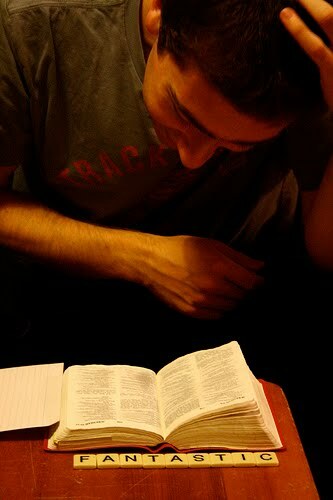 At first I felt guilty that I was enjoying reading the bible, which revealed how much I’d considered reading scripture a chore rather than the joy it is. I find that I get different elements out of reading scripture through the medium of sound as opposed to a written text; not necessarily worse or better, just different. For instance, it doesn’t help me remember where things are in scripture, but it does help emphasise repetition in a passage and link key ideas better. The most amazing thing is that since I’ve been listening to daily podcasts, I’ve read scripture much more as well. So if you’re struggling with bible reading, I strongly recommend trying out a daily podcast. Thanks, David, it’s helpful to have some digital alternatives. Perhaps one of us should write a post on that! Not me, though, I’m useless at this. Maybe we should suggest it to Challies (who’s suggested his own 3650 challenge for 2012). On the comment stream on this post on my own blog, someone suggested the YouVersion App for the iphone. Sounds good. I have the YouVersion App, and it is great for both written and audio. I’m intrigued that the app allows one to download versions of the bible for free, and wonder how legal it is. But given that, it’s a wonderful resource. A daily podcast subscription has the advantage that new updates can be pushed to your device daily. An app such as Pocket Casts (for iPhone or Android) can remind you when a new “episode” is ready, and the reminding really helps to get into a routine. I’ve just searched “ESV” and found the following yearly reading plans available: Chronological, ESV Study Bible, Every Day in the Word, M’Cheyne, Daily Office Lectionary(? ), Daily Reading Bible and Through the Bible in a Year. I’m going to try the M’Cheyne plan this year. My only hesitation with reading great slabs of the Bible each day is whether it leaves any room for the careful consideration and study of the Bible. Sometimes when I read long stretches I don’t have the brain space to process properly what I have read. If you could have the time and energy to combine the 3650 project with some more in depth Bible study (not of the ten chapters a day but of another portion of Scripture) then that would be ideal but… do we have enough time and brain space in our days to do that? Good point. Yes, this is not the only way I’d like to read the Bible. In fact I enjoyed reading 2 Chronicles so much as I went through my reading plan that I’ve stopped for the moment and I’m spending a few weeks reading and studying it in detail. But I would never have discovered how much I love 2 Chronicles (it would never have occurred to me to read it!) unless I was reading through the Bible. There are also some benefits to reading chapter after chapter rather than a small section: my guess is that’s the way the Bible was written to be read. There’s also a place for close study – of course there is! – so I’ll vary my reading style. But there are benefits to reading big chunks too.